Acetaminophen is included as an ingredient in many medications. It can be purchased over-the-counter (OTC) in the form of Tylenol, but also is found in some prescription drugs, such as Vicodin and Percocet. Acetaminophen is easy to obtain, but it is toxic to the liver and has a high risk of overdose. Acetaminophen reactions are a common form of poisoning seen around the world. In the United States, the United Kingdom, Australia, and New Zealand, acetaminophen is the most common cause of drug poisoning. It is the most common cause of liver poisoning and acute liver failure in the U.S.
More calls in the U.S. to poison control centers are related to acetaminophen than any other drug. These account for more than 100,000 calls, with 56,000 emergency room visits, 2,600 hospitalizations, and 458 deaths. 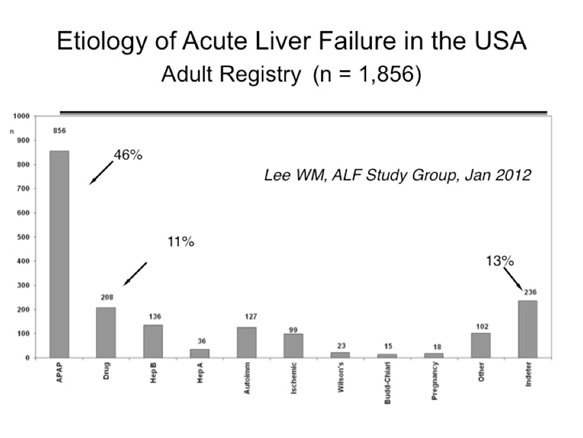 Over 40% of the cases of acute liver failure in the United States are from acetaminophen. How can I tell which medicines contain acetaminophen? 2014-01-14: Acetaminophen Prescription Combination Drug Products with more than 325 mg: FDA Statement - Recommendation to Discontinue Prescribing and Dispensing: FDA is recommending health care professionals discontinue prescribing and dispensing prescription combination drug products that contain more than 325 milligrams (mg) of acetaminophen per tablet, capsule or other dosage unit. There are no available data to show that taking more than 325 mg of acetaminophen per dosage unit provides additional benefit that outweighs the added risks for liver injury. Further, limiting the amount of acetaminophen per dosage unit will reduce the risk of severe liver injury from inadvertent acetaminophen overdose, which can lead to liver failure, liver transplant, and death.